Browse Artists and Groups John Little, R.C.A. 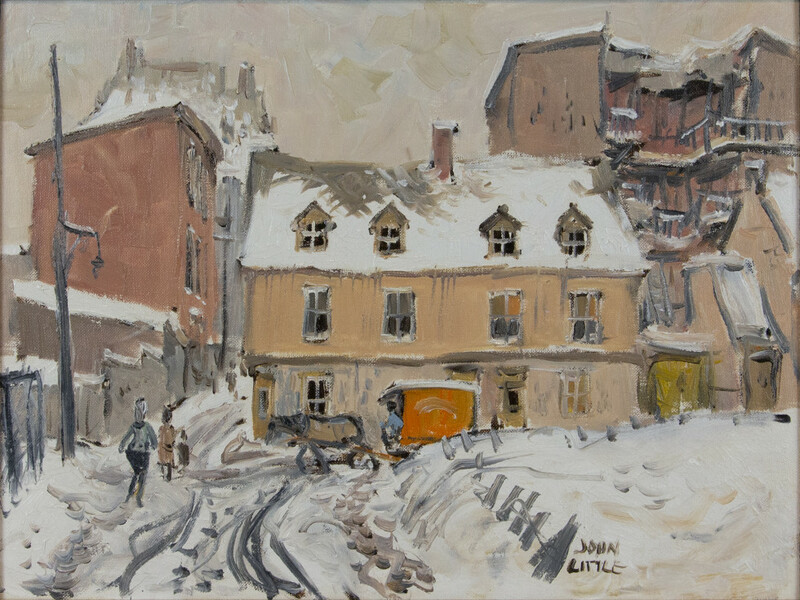 Born in Montreal, Quebec on February 20, 1928, John Little studied for two years at the Art Association of Montreal (today the Museum of Fine Arts) under Dr. Arthur Lismer. In the late 1940s Little moved to New York City to attend the Art Students' League, training under Will Barnet and Frank J. Reilly. It was also there that in the spring of 1948 he got a job working under Ray Baillie on the now defunct comic strip "Bruce Gentry". Returning to Montreal, Little worked with his father who was a partner in his architectural firm, Luke & Little, while also attempting to do illustrations for the Montreal Star. In 1952 he married Lorraine. 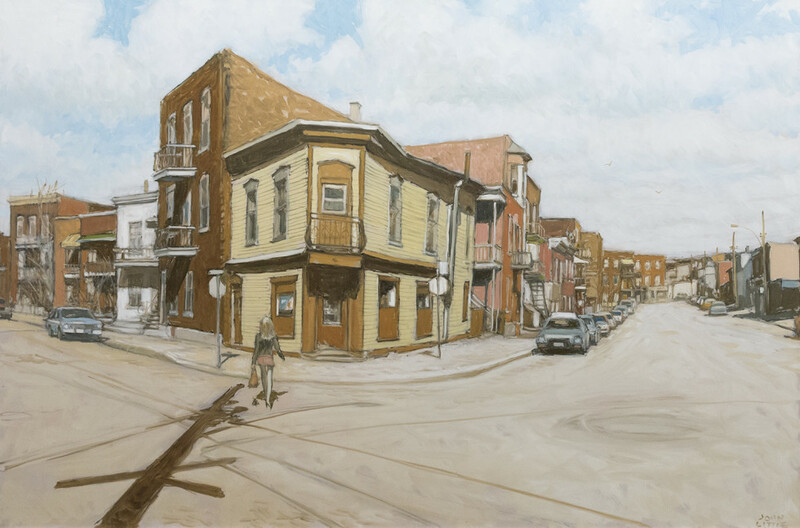 Little was greatly aided by William Watson, the Montreal art dealer who took a great interest in the artist's characterizations of Montreal, Quebec City and the outlying regions of Quebec. Watson exhibited them in his Montreal gallery where they ultimately won wide acclaim for Little. 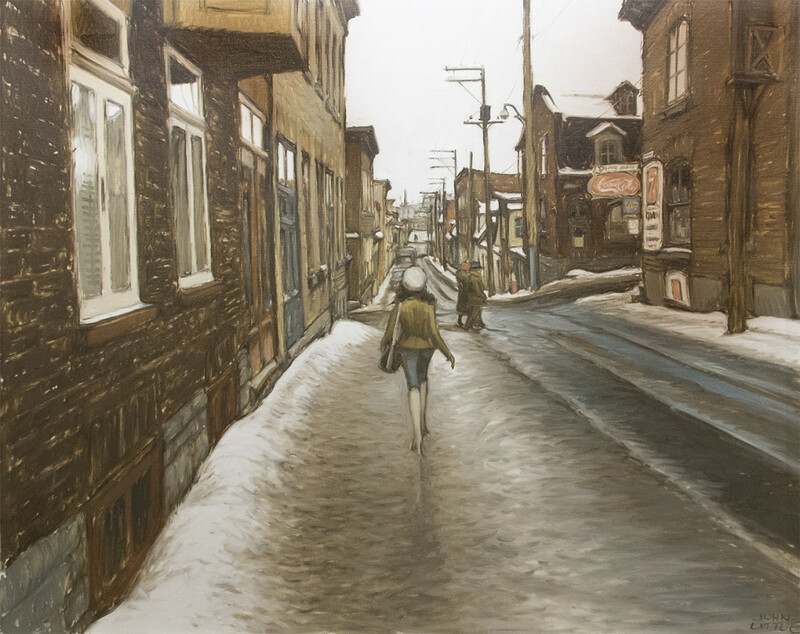 Upon the closing of Watson Galleries, the young artist began showing at Montreal's Continental Galleries and at Galerie Walter Klinkhoff. 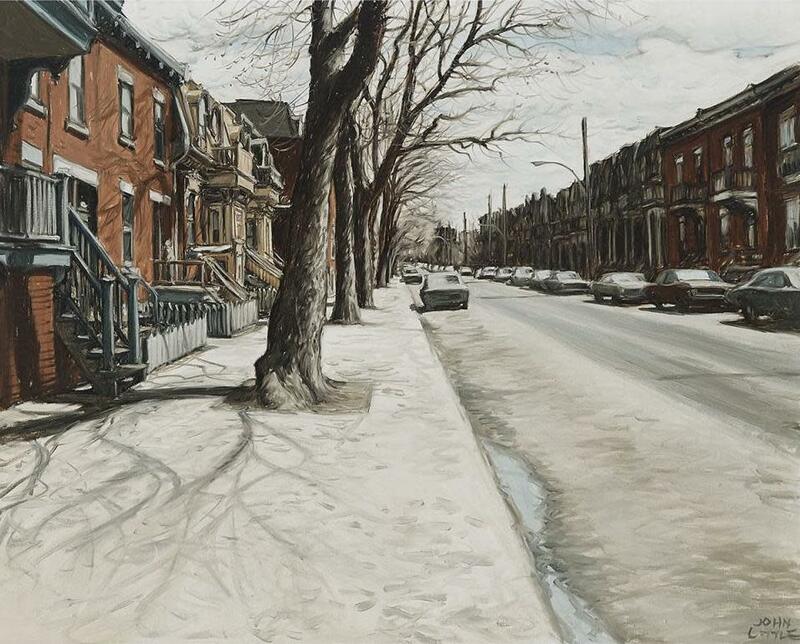 In 1961, Little became an Associate of the Royal Canadian Academy of Arts. 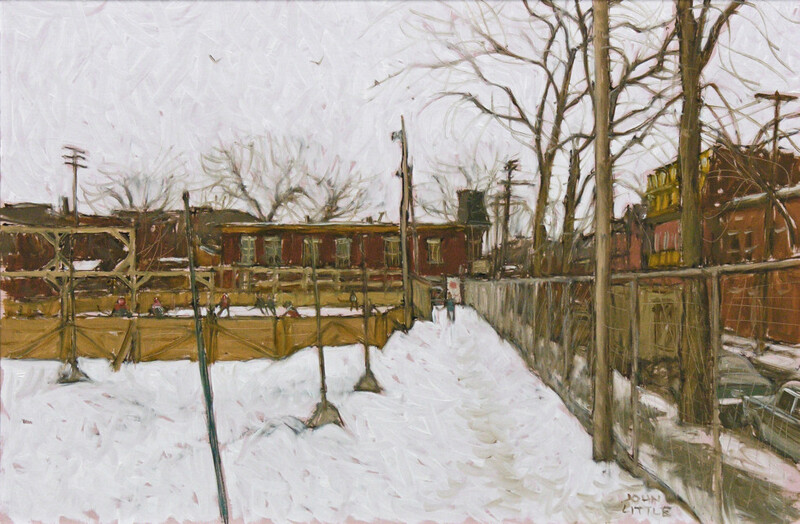 "Those bemoaning the seemingly ruthless demolition of hundreds of Montreal's gracious old-world homes and other buildings, the disappearance in the name of progress of various little nooks and parks, and the often callous disposal of dignified stone pillars and amusing cornices will gain nostalgic pleasures from John Little's show, for he had dedicated his painting to the preservation of such items for posterity. …Three important qualities it certainly contains: assurance, individuality and artistic honesty." 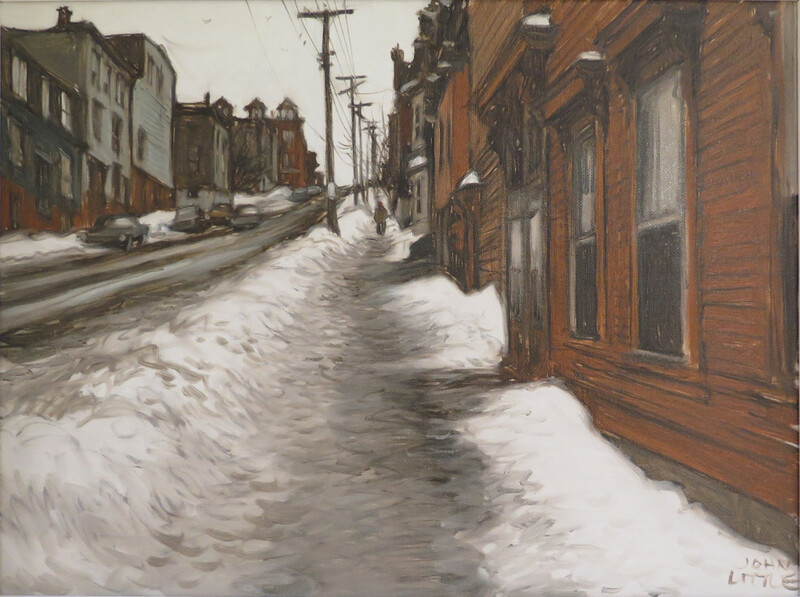 Painted over a career that lasted for more than sixty-five years, Little's work has taken on an even greater significance in the context of Canadian art. He has celebrated the urban core, the neighbourhoods and the ethnic communities of the inner city, his oeuvre forming a critique of the devastation of the city centre brought on by the urban planners of the 1960s and the development of the suburbs. 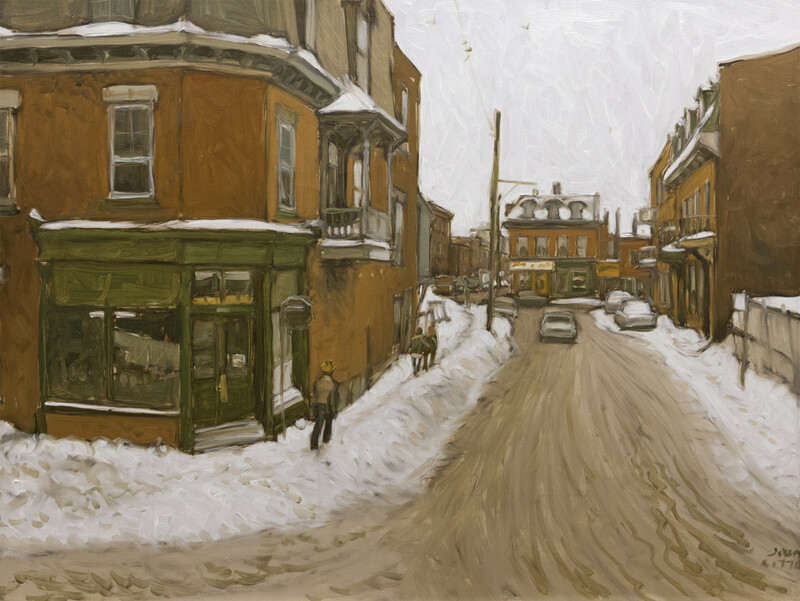 Maintaining his vision, using for the most part Montreal and Quebec City as his painting place, and with consummate integrity, John Little has become Canada's premier urban painter. In 1973 he became a full member of the Royal Canadian Academy of Arts. He has painted covers for MacLean's Magazine, and his paintings are in the collections of the National Gallery of Canada, the Beaverbrook Art Gallery, the Concordia University Collection of Art and private collections across the country. In addition, today, his paintings are among the most sought after of the artists of his generation in Canada. For over fifteen years, John Little's recent works were available exclusively at Galerie Walter Klinkhoff. Please send me more details about the following artist. John Little, R.C.A. inscribed, "ALFRED 'PIT' LEPINE / CENTER LEFT AND SHOT / MONTREAL CANADIENS / Born in STE ANNE DE BELEVUE P.Q. JULY 31, 1901" (verso, left stretcher bar). inscribed in ink by the artist "WILFRED 'WILF' CUDE GOALIE - BORN BARRY WALES - JULY 4 1910 / MY COACH IN TM.R. JUVENILE HOCKEY / MONTREAL CANADIENS 1934 - 1941." (verso, right stretcher bar). inscribed in black ink by the artist, "reproduction / exhibition rights reserved by artist" (verso, left vertical stretcher). 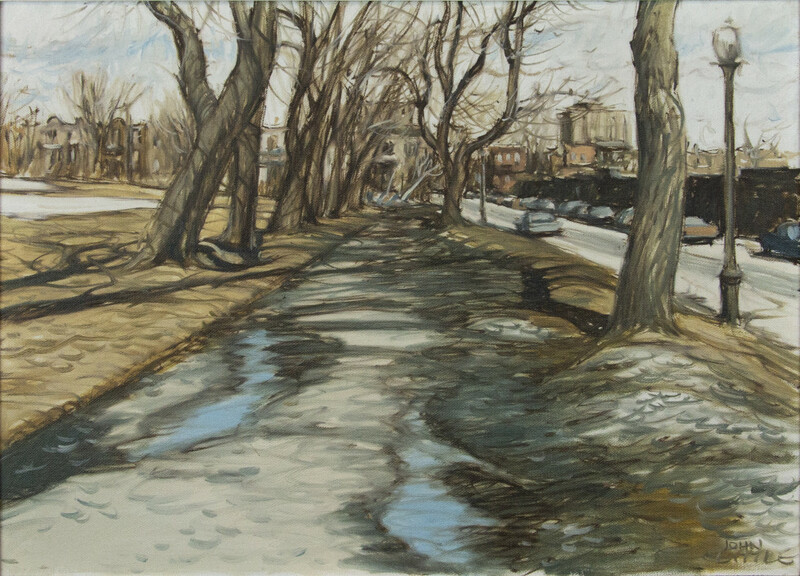 titled in graphite "Le Printemps a Rue Duluth et rue Esplanade (sic) / Fletchers Field Montreal." inscribed in black ink by the artist, "reproduction rights reserved by the artist" (verso, left vertical stretcher). 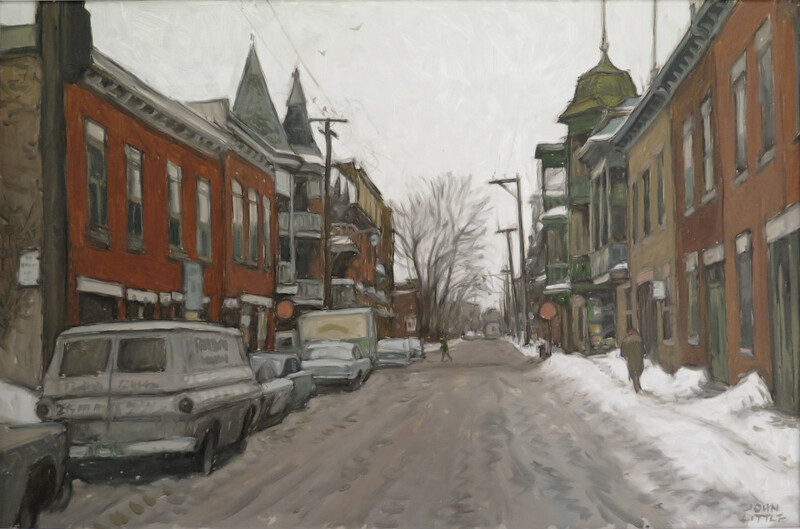 signed, titled, dated in pen "Sketch / O'Connell and St. Simon / Quebec City Feb 1960 / JOHN LITTLE" (verso).